The historic cities of Fredericksburg (40 miles north) and Williamsburg (56 miles SE) are within an hour's drive. Bounded on the northeast by the Rappahannock River, Essex County has water access to the Chesapeake Bay and its tributaries including major port facilities at Hampton Roads. The county's principal town, Tappahannock, dates back to a 17th century port settlement. Originally part of Old Rappahannock County, Essex County was formed in 1692 and named for either the English County or the Earl of Essex. Elevation: Sea level to 200 ft.
Forests - 107,164 wooded acres (62.9% of county); most privately owned, Class 4. Water - Groundwater occurs in three major aquifer systems. Adequate groundwater supplies exist in good quality for present and distant future. Water table aquifer is 50 to 140 feet below the surface and may be highly mineralized. Upper artesian is 150 to 200 feet below the surface. The principal artesian is 200 to 400 feet below the surface. Minerals - Sand, shale, and gravel occur in large quantities. Tappahannock area weather forecasts can be found on WRAR Weather Radio - 105.5 FM, VHF radio channel 2, Public service frequency 162.400. * The Bank of Essex has a total of 100 employees, 50 are employed in Essex County. Electricity - Supplied and distributed by Dominion Virginia Power (888-667-3000) - for current status Dominion Virginia Power has set up an information page specifically for our Northern Neck and Middle Peninsula region. The northern part of the county is serviced by Rappahannock Electric Cooperative (800-552-3904). Sewerage - Supplied by the Town of Tappahannock (804-443-3336), which has a separate storm sewerage system. The average daily use is 252,000 gallons and the maximum treatment capacity is 400,000 gallons per day - secondary treatment. Other sources: Riverside Tappahannock Hospital operates a private system; individual septic tank systems service most residential needs. Solid Waste Disposal - Essex County is a member of the Virginia Peninsula's Public Service Authority. The Authority accepts non-hazardous waste. Trash Pickups - Weekly in Tappahannock (804-443-3336) for residents and for some businesses. Recycling pick-up day is Thursday. Contracted services are available through various businesses for county and other commercial accounts. Trash Collection Sites - Essex County operates three trash collection sites: Bray's Fork on Route 17, just South of the Rt.17 and Rt.360 intersection; Champlain on Rt. 17 North; and at Center Cross on Rt. 684. Check with the County Administrator's office for times, days and rules of operation at (804-443-4331). Recycling - Weekly green bin curbside pick up at residence on Thursdays. Roads - U.S. Routes 17 and 360. The Virginia Department of Transportation, resident engineer is located at Bowling Green (804-633-5091). Airports - Richmond International Airport (40 miles southwest) and Newport News/Williamsburg International Airport (70 miles south) provide daily passenger and air freight services by major commercial airlines. The Tappahannock Municipal Airport (804-443-5885), located at 1450 Aviation Road, 3 miles West of Tappahannock on Route 360 has a 4,300 foot paved runway and provides both fuel and maintenance. Newly constructed hangers are available, call today to secure your space. Waterways - The Rappahannock River is navigable along Essex County and provides access to the port complex at Hampton Roads. Motor Freight Carriers - Richmond-area trucking firms serve Essex County. There are four banks in Essex: EVB (Eastern Virginia Bankshares), Bank of Essex, Northern Neck State Bank and Citizens & Farmers Bank; with assets ranging from $43.8 million to $700 million. See the Financial Services page for more information about these banks and other financial institutions. Essex has an Economic Development Authority empowered to issue revenue bonds. Radio - WRAR Radio, FM 105.50 and AM 1000, Tappahannock (804-443-4321); WNNT River Country on FM 100.9, Warsaw (804-443-4321); plus reception from Richmond, Northern Virginia, the Middle Peninsula and Northern Neck. Television - Reception of Richmond area stations including ABC, NBC, CBS, FOX and independent stations. Tri-State Cable Comm (Time Warner) (800-849-7070), supplies cable television service with 33 channels. Several independent suppliers install and service satellite Direct TV receivers. Telephone - Verizon of Virginia. New service and inquiries (800-483-4300), repairs (800-483-1000). Cellular Telephone - Verizon of Virginia, Nextel, and Cellular One all provide cellular phone coverage of the Tappahannock and Middle and Northern Neck Peninsula areas. In Virginia, counties, cities and towns are separate taxing entities. A manufacturing company pays either county or city/town tax, depending upon its location. However, if it is located within the corporate limits of a town, it is subject to both city/town and county levies. Essex County is governed by a four member Board of Supervisors. A County Administrator oversees the daily operation of the county. The Town of Tappahannock is governed by a seven-member Town Council headed by a Mayor. A Town Manager handles the town's daily activities. Both the county and town have adopted a comprehensive plan and a zoning ordinance. 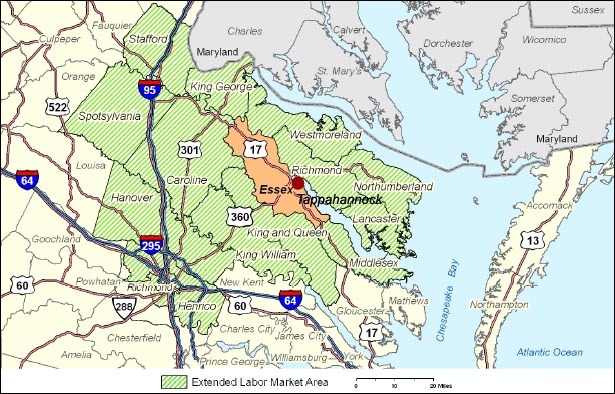 Essex County and the Town of Tappahannock serve as a regional trade center due to its strategic location at the junction of Routes 17 and 360. The economy is varied, from agriculture to manufacturing to services. Principal types of industrial establishments are metal stamping, garment, automotive parts and sub-assembly parts manufacturers. Major commercial establishments are service-related with food, lodging and retail sales predominating. Agriculture, forestry and fishing industries still play a large role in the local economy, with many establishments serving these industries. The agriculture and forestry industries are major contributors to the overall economy in Essex County. According to the Economic Impacts of Agriculture and Forestry Industries in Virginia, June 2013, the direct economic impact of the agriculture and forestry industries in the county in 2011 was $68.2 million with agriculture contributing $23.4 million and forestry contributing $44.8 million. The same impact study also found that there were 470 agriculture-related employees and 371 forestry-related employees for a total of 841 in 2011. Of the 50 largest employers in Essex County, five (10 percent) are agriculture/forestry businesses (Virginia Employment Commission 4th quarter 2013). According to the 2012 United States Department of Agriculture Ag Census, there are 98 farms in the county with 37,129 acres of harvested cropland. The major agriculture crops harvested in Essex County are corn (15,976 acres), wheat (8,702 acres), barley (2,231 acres), and soybeans (19,254 acres). The county also has about 1000 head of beef cattle. The market value of agriculture products sold in Essex County was $22.77 million in 2012. Crop sales accounted for $22.43 million while livestock sales accounted for $.34 million. Land in forests in 2012 was 86,940 acres. Estimates at the local level indicate approximately two-thirds of the forest acreage in Essex County are grown in pine with the remainder in hardwood (Forest Inventory and Analysis). According to the Virginia Department of Forestry, the forest harvest value (what landowners were paid) was $4.4 million in 2012. Available at County Administrator's office, Lowery's Restaurant and at the Essex County Museum. The only incorporated town in Essex County, Tappahannock sits on the shores of the Rappahannock River. In less than three square miles, Tappahannock exhibits many positive features including a waterfront, historic downtown, residential subdivisions, a business corridor development, and extensive wetland areas. Churches - 62 Protestant Churches and one Catholic Church. Library - The public library houses 17,000 volumes. Recreation - Public ball fields and swimming pools along with private tennis courts, golf courses and bowling facilities offer recreation to residents and vacationers. The county offers a recreation program using public school grounds and buildings, and it's own park and pool. The Rappahannock River offers a variety of water activities including beaches, public and private boat ramps, fishing and sailing. Riverside Wellness and Fitness Center - Two outdoor tennis courts, two racquetball courts, basketball and volleyball courts, strength training circuits, treadmills, stair steppers, indoor cushioned track, indoor 25 meter heated pool, massage therapy, sauna and Jacuzzi. Hospitals - Riverside Tappahannock Hospital (100 beds) in Tappahannock offers services in X-ray, nuclear medicine, physical therapy, respiratory therapy, family medicine, emergency services, cardiology, and orthopedic surgery. Riverside Middle Peninsula Hospital (71 beds) offers general medical and surgical care, ICU and 24-hour emergency services. There are several major hospitals in Richmond (45 miles) including Virginia Commonwealth University's Medical College of Virginia, and the new Memorial Regional Medical Center at I-295 and Meadowbridge Road. Public Health - The public health department offers regular X-ray, family planning, child health, obstetrics, Medicaid, and immunization services. The department also tests private well and septic systems and has programs in rabies control and restaurant inspections. Essex County employs 11 officers in its Sheriff's Office and the Town of Tappahannock employs five police officers. There are five State policemen and one sergeant assigned to the area. Fire protection is provided by a volunteer force of 60 from the town and county. The local rescue squad has 19 member and is enhanced by County contracted professional service. For more details see the Emergency Services page. Essex County Public Schools (ECPS) is comprised of one elementary school (pre-K-4), one intermediate school (5-8), and one high school (9-12). Total student enrollment is approximately 1,450. Please contact or visit our schools to learn more. Private Schools: Aylett Country Day School, St. Margaret's School, Tappahannock SDA Junior Academy. For more information about the schools in Essex County Visit the Schools page. Colleges/Universities - Essex County is served by Rappahannock Community College's two campuses in Warsaw (7 miles) and Glenns (28 miles). Each offers programs in college preparatory, vocational, business, technical and trades. Within an hour's commuting distance of Essex are some of the finest colleges and universities in Virginia, including the College of William and Mary in Williamsburg and the University of Richmond and Virginia Commonwealth University in Richmond.